Carol is licensed as a wildlife rehabilitator by the PA Game Commission, Fish and Boat Commission and the US Fish and Wildlife Migratory Bird office. She grew up in Springfield, Ohio where she had an affinity for wildlife and helped injured animals get care from wildlife rehabilitators, a fledgling profession at the time. After graduating from Earlham College, she obtained an MA from Northern Illinois in Outdoor Education and worked in outdoor programming at various environmental education centers, Outward Bound and for ten years at Allegheny College. 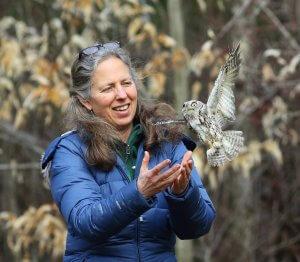 In 2006 she began working at Tamarack and specializes in the care of raptors. She finds it a privilege to work with the wildlife and volunteers at Tamarack and is inspired daily by all who contribute to make the center possible. Outside of Tamarack, she enjoys time with her family, and being outdoors. No stranger to Tamarack, Laryssa interned at our center in 2014 as part of her degree program from Edinboro University, majoring in Writing with a minor in Biology. 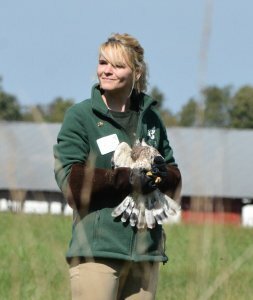 In 2015, she worked at the World Bird Sanctuary in Missouri, treating wildlife, training raptors and giving programs. She also trained animals at the Milwaukee Zoo. After returning to our area in 2016, she became our most experienced medic, proficient in treating patients ranging from powerful Bald Eagles, to delicate infant Cottontails and joined the TWC in 2018 as Wildlife Rehabilitation Manager. With a particular passion for raptors and training, Laryssa is an apprentice falconer in her personal time, and uses her falconry skills to design training plans for our ambassadors to ensure they are comfortable and confident. She also helps Tamarack volunteers develop their skills working with wildlife. Jennifer Ferrick, joinedTamarack as our office manager in 2018. Tamarack’s mission inspires Jennifer, and with a BS in Business Administration, her organizational skills and attention to detail are creating more efficient office processes for TWC. She values that Tamarack tends wildlife medically, contributes data to wildlife research, and does public education and outreach. Jennifer has been fascinated with birds since age five, and that has led to her lifelong conservation efforts. 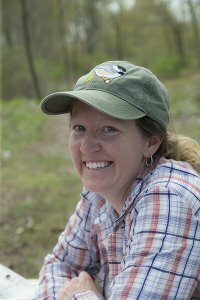 In addition to her work with Tamarack, she contributes to scientific avian research with the goal of supporting effective conservation education. Over the past year, Jennifer has participated in gathering data for organizations including PA Audubon, Erie Bird Observatory, PA Goshawk Project, and Project Puffin. She recently accepted the position of Chair of Public Relations at Presque Isle Audubon Society. 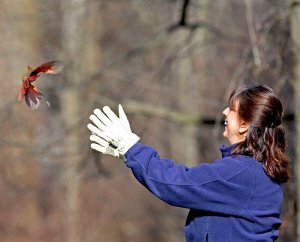 With a passion for songbirds, Gina Kron began volunteering with Tamarack in 2011 and now rehabilitates non-raptor birds from her location in North East, with licenses from the PA Game Commission and US Fish and Wildlife Migratory Bird office. Gina meticulously researches diet, and husbandry for the varied species she treats, and is committed to her continuing education. She is gifted in convincing concerned members of the public to attempt reuniting young songbirds with their wild families prior to arranging for admission. With an eye to detail, she has successfully rehabilitated tricky species such as Woodcocks and Swifts. Gina also owns and operates four Tim Horton’s stores, in addition to enjoying her family and grandchildren. A crew of volunteers, including onsite assistants, interns, medics, and educators do such things as feed and care for the wildlife, give education programs, and manage the other daily needs of the facility. Also assisting the center's staff are Wildlife Helpline Volunteers. These trained volunteers respond to phone messages left at the center regarding injured wildlife or other questions. Tamarack's hands-on Board of Directors handles behind the scene details such as fundraising, promotion and finances. Remember, only a Licensed Wildlife Rehabilitator can care for injured wildlife. Please DO NOT try to treat wildlife yourself. Tamarack's expert team can be reached at: 814-763-2574.